Born/lived: Alton, Illinois/lived in New York and summered in Mountainville, NY, lived MO, Gloucester, MA. Best known for: Her painting style was impressionist, with attention to qualities of light, deliberate brushstrokes and rich colors. She was influenced by and painted with John Sloan. In her landscapes and seascapes one can see the influences of the French modernists, utilizing spatial planes and abstract patterns. She specialized in painting independent, dignified portraits of women. Known to few, but later found in her estate, were many paintings of landscapes, harbor scenes, and interiors. Studied: St. Louis School of Fine Arts; Arts Students League with Twachtman, Appleton, Clark and Kenyon Cox and instructed there from 1910-1914. Member: National Association of Women Painters and Sculptors; Allied Art Assoc; Fifty American Artists; Brooklyn Society of Artists; Brooklyn Painters and Sculptors; AAPL. Exhibited: National Academy of Design; Pennsylvania Academy of Fine Arts; Society of Independent Artists; National Association of Women Artists; Corcoran Gal; pan-Pacific Expo, San Fran; Salons of America; Sesqui Cent Int Expo, Phila; The Fifteen Gallery; New Rochelle, NY; Carnegie Inst. ; Brooklyn Museum; Smithsonian; CGA; Water Color Club; CI; Newport: San Diego FA Soc; AAPL; Allied Artists of America; J. Allen Gallery, NYC; Hickory Museum of Art, NC; Brooklyn Society of Artists; “American Women of the Twenties, an Exhibition of paintings by Agnes M. Richmond”, 1870-1964, Jeffrey Alan Gallery, NY, 1981, illustrated in catalog. 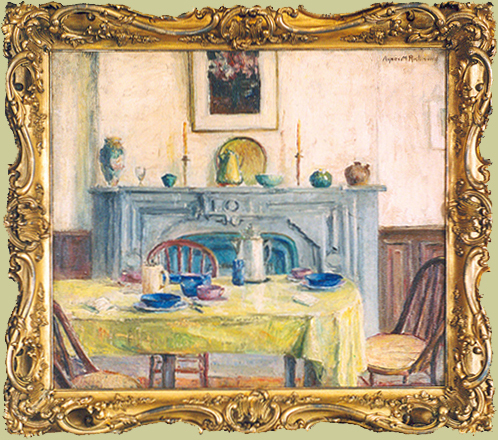 Awards: the Watrous Prize in 1911; National Association of Women Artists; New Rochelle, NY. She served on Juries of Selection and Award with notables of her time such as Bessie Potter Vonnoh and Cecilia Beaux. Work: Hickory Museum of Art, NC, San Diego Fine Art Society. Materials oil on canvas, From the estate of Agnes Richmond. Orignal period frame. This painting is in excellent condition. Comments From the estate of Agnes Richmond. Orignal period frame. This painting is in excellent condition.